The Second Amendment clearly supports an individual right to bear arms. The Second Amendment is a total prohibition on gun regulations. No gun regulation can be passed that will infringe on the right of the people to bear arms. A milder version of this theory is that the Second Amendment prevents the ban of any firearm. Any gun regulation is a slippery slope to complete disarmament. The Second Amendment is not an absolute guarantee to own any firearm, and until recently was not considered an individual right. For most of America’s history, the Second Amendment was interpreted as only applying to militia service, unlike in many state constitutions where the individual right to bear arms is clearly spelled out. Even though there is some scattered evidence supporting the view that the Second Amendment is an individual right, for most of the 20th century (when gun-control entered the national discussion), the consensus view was that it protected a collective right, nothing more. As the Supreme Court ruled in United States v. Miller, a case challenging the first major federal gun control law, the right of the people to keep and bear arms is an individual right only in that it requires individuals to man a militia. It was not until very recently that the right was detached from such service and declared a purely individual right. The debates during Virginia’s ratification of the Constitution are especially illuminating. The Federalists argue that the power of the Federal Government over Militias was necessary for the defense of the nation, and was not exclusive to the Federal Government (i.e. states still have some say in the matter). Anti-Federalists rejoined that this was too much centralized authority and the Federal Government could abuse this power to the detriment of the states. For example, as Carl Bogus explains in “The Hidden History of the Second Amendment,” during a slave rebellion, the Congress could conceivably call the Militia to deal with a “threat” somewhere in the North, thereby leaving Southern States helpless. Conspicuously lacking from this debate was any discussion about an individual right to bear arms. The entire debate centered around which government was really in charge of the Militia, State or Federal, not whether citizens could carry arms outside militia service. Until the Fifth Circuit’s decision in United States v. Emerson, 270 F. 3d 203 (2001), every Court of Appeals to consider the question had understood Miller to hold that the Second Amendment does not protect the right to possess and use guns for purely private, civilian purposes. Even with the court’s massive break from precedence, the majority opinion still holds that the Second Amendment right to keep and bear arms is not unlimited. Not one of the justices sees the Second Amendment as guaranteeing a right to own any firearm, and certainly not without restrictions. Indeed, as Adam Winkler, a constitutional law professor at UCLA, notes, in the nearly 200 rulings on the constitutionality of gun control by lower courts since DC v. Heller, almost all of them supported the current gun laws. It is unfair to compare the guns that are currently legal to the weapons mentioned above. Those weapons aren’t needed (unlike assault rifles) and some crazy dude may use one to attack a school or something. Let’s start with the “unfair comparison” argument. While is certainly would be unfair to compare most handguns and small-game hunting rifles to these weapons, assault weapons are in the same league as machine guns. In most situations automatic fire is less effective than semi-automatic, and large machine guns are impractical to carry by hand. As we explained in The Hammer Theory of Guns, the only difference between military assault rifles and the civilian versions is the ability to go automatic, which does little to change the killing capacity of the weapons. A .50 caliber rifle (which is legal) is designed to blast through walls and stop vehicles. A gun advocate may point out that very few people are killed with assault rifles and .50 caliber rifles, which is true. However, very few people in the US are killed with machine guns or RPGs as well. Would that be a legitimate argument for legalizing them? Hardly. The second response parallels the arguments of those favoring further gun control and assault weapons bans. Assault weapons simply aren’t necessary for self-defense or recreation, and some crazy dudes do use them to catastrophic effect. The third response is merely a subset of Insurrectionism. If one supports the inane notion that the Second Amendment was written with insurrection in mind (which we thoroughly debunked in Part 1), one would then also have to admit that the bans on heavy weaponry are unconstitutional. If the purpose of the Second Amendment is to prevent tyranny by threat of violent revolution, then it would make no sense for the Amendment to permit a ban of heavy weaponry (which would be necessary to violently overthrow a well-armed tyrannical government). Insurrectionists often argue that even small controls only further tip the balance of power toward the government, and make further gun control more likely. Gun regulation and the Insurrectionist interpretation of the Second Amendment are completely incompatible. As the majority opinion in DC v. Heller expresses though, “prohibiting the carrying of dangerous and unusual weapons” is permitted. The Insurrectionist theory of the Second Amendment then is still completely at odds with the most pro-gun Supreme Court decision in history. There is no intellectual basis at all to support the idea that the Second Amendment provides for an unlimited right, and thus completely undermines the Insurrectionist interpretation. The interpretation of the Second Amendment as an individual right is a relatively recent phenomenon. The Second Amendment does not provide an unlimited right, meaning that gun control is completely constitutional. 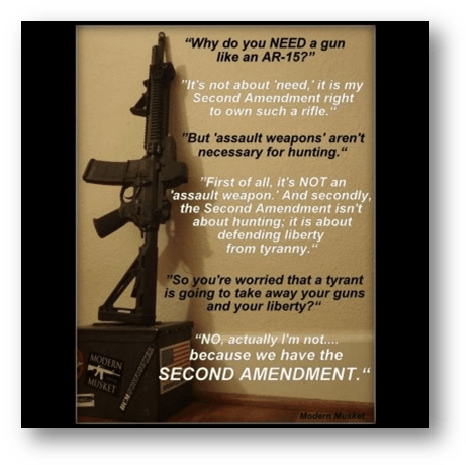 The Insurrectionist interpretation of the Second Amendment is still completely at odds with the history surrounding the Amendment, the text of the Constitution, and every Supreme Court decision on the issue. Part 3 will debunk the myth that Militias (even in the Constitutional sense) are effective at preventing tyranny. Part 4 will tackle the broader philosophical debate of the freedom to bear arms.